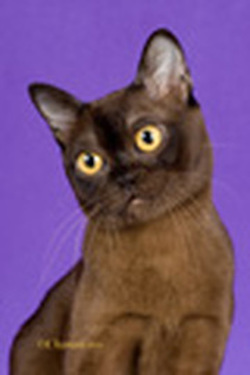 On this page and the next you will meet the cats in our current breeding program. Three catteries share several males. It is a huge advantage to have so many males available to our breeding programs. Besides the three pictured on this page we have Bodrouex who lives at Kittakiss cattery, and soon to visit, Dreamabout's Hollywood coming from West Virginia. In addition Eclypse Pedro, a champagne kitten, has just arrived from Montreal. This kitten is Ch Panthat Ptesan, S'more's son. He is now 10 months old and has joined the breeding program. His name is Lakota Sioux for White Buffalo. Eclypse Pedro of Panthat beginning his show career.